NA3AM is proud to highlight the work and accomplishments of creative people, organizations and projects globally! Our collaborative platform aims to promote compelling and inspiring stories, which empower women, counter hatred and discrimination, and invoke unconventional creative expression that drives CHANGE. 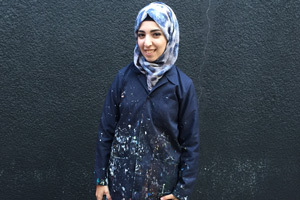 Meet Laila Ajjawi, a RARE 25 year old Palestinian graffiti artist using her talents to create awareness around the power and potential of women. She stopped by the NA3AM office in Amman, Jordan to share her story and bless our walls with her creative genius! See what she had to say about the impact she hopes to make as a female street artist! I have my own style “ Laila’s Style” which always include special characters that expose the identity of the place where it’s being done at. Also, I always add an Arabian touch to my art. 2. Is there one else who does graffiti in your community? 3. Have you ever done any commercial work? Yes, but it depends on who I’m going to work for and what is the concept behind the drawing and if the offer suits me. what matters the most to me is the concept. 4. Do you think Graffiti art has become over exposed? Yes I think it is exposed in Amman, but not in other cities. There are a group of Graffiti artists in Amman who participate in events and do very nice work. 5. Have you had any moments where you were hassled by the police? Not at all, and I’m not planning to get myself into any trouble. whenever I do a campaign, we always get permission from the authorities because I don’t want to reach a point where I see my art being erased or where I have to pay a fine. 6.How did you develop your drawing skills? At first things were not as easy because I have a weak body that couldn’t handle the pressure of the cans, so I trained myself to gain muscles to be able to do this. Also, I practice a lot in order for me to be faster and more accurate. 7. If you could teach or deliver a message to a new generation of Graffiti , what it would be? Don’t do it for fun. Always respect the culture and the place you’re drawing in. Your art has to be meaningful as much as possible because it is owned by all people so you have the chance to affect their minds and thoughts. 8. Is there any life situation that inspires you? The situation that we are living now, we are facing lots of stereotypes from outside our region about how girls here are victims, slaves for men and don’t have any rights, so I’m trying to change that because I believe that we do have many girls who can take the lead. Through my art, I’m challenging these stereotypes but in a way that is acceptable by the community because I don’t want to be an enemy, I want to have people to support me and see me as an idol for them. I want to inspire people that they can take control of their life and achieve their dreams. 9. Tell me about you background? I grew up in one room inside a camp, less than 25m. I grew up under very poor and hard conditions with two loving parents who are fighters and spent their life trying to do their best in order to provide a better life for me and my siblings. I used to be very smart at school, always getting high grades. I was not greedy, I didn’t look at what other people have or do. I was pleased with what I have. My parents worked hard to build a house over my grandparents house, though it’s small, it is better than the first one, at least we own this one. I have 3 sisters and 2 brothers and I’m the oldest one, so I had to take responsibility at a very early age. My Childhood was very nice, I’ve never had the chance to ask my parents to buy me anything, I had my imaginary world. I really appreciate everything that my parents did for me, so it’s time to have my family enjoy and rest while I take the lead now. 10. Is there any particular theme you pursue with your Graffiti? Every single graffiti I do is different from before because it’s getting better and richer with the techniques I use, so while I’m getting better, my style is becoming unique. 11. Do you have a favourite artwork? “Look at my mind” which was my first mural in Women on Walls (WOW), a feminist street art campaign in the Middle East. I love this artwork because of many reasons related to my life, it is based on watercolor artwork and the anatomy of the girl’s face is based on a picture for me. I was trying to deliver a message to the world with this artwork, which is to stop being superficial and to start look at the inner beauty of people. The message is meant to be for both men and women, for men to urge them to look at women’s inner beauty rather than considering them just a body, and the massage for women is to start pay more attention at developing their minds and thoughts as much as they spend time looking after their beauty. 12. Who motivates you or inspires you to do Graffiti? Most importantly, My parents. Also, I have so many people that inspire me, who appeared in my life in times when I most need them. They were like the spark that keep me going. 13. What other jobs have you done other than being an artist? I work at an NGO in the humanitarian field. I used to work as a Private English and science teacher. I also worked as a social worker and a trainer at other NGOs. 14. What do you dislike about the artworld? I don’t like that not every artist is being appreciated. We see some artist who could sell their art at very high prices, while there is more talented artists who can’t do this because of their background or maybe they don’t have money to do galleries. Another thing I dislike in art, in some art faculties, they are just trying to copy of a certain famous artist, putting lots of rules and lots of rights and wrongs. There are no right and wrong in art. 15. What do you like about your work? It takes me away from the pressure and stress of life. Also, it gives me a chance to deliver a message, which is to be yourself in a world full of copies. 16. What superpower would you have and why? Reading Minds because then there is no need to ask or to wait for answers. I like this quote: “ hurt me with a truth, but don’t satisfy me with a lie”. I also would love to have the power to travel through time so I can go back in time for when I was young and helpless, and I can assure myself that everything would turn out to be just fine. 17. What is the best piece of advice you’ve ever been given? 18. Professionally, what is your goal? I like to be part of the gaming and movie sector. I believe that when I get into these fields, I will add values that we really need. 19. When did you first become interested in Graffiti? 20. Does anyone in your family do Graffiti? No, though I have so many talented people in my family but they didn’t develop their skills like I did. 21. what else do you do beside Graffiti? I love creative writing, blogging, doing digital illustrators. 22. What is the best thing about being an artist? and what is the worst thing? The best thing is that you can express yourself. The worst thing is being sensitive and taken advantage of. 23. What is the main challenge you faced when you started doing Graffiti? My body weakness, muscular weakness and the conditions of the street like sun cold and height. 24. How / in what way your Graffiti helps change the way your country thinks about Girls? Whenever I present a female character into my drawings, I present her as a leader in order for people to know what girls can take the lead. I want to break the stereotype of women referred to as weak so that men can start looking at them as equal. NA3AM Welcomes Brendan Wright as Executive Editor.